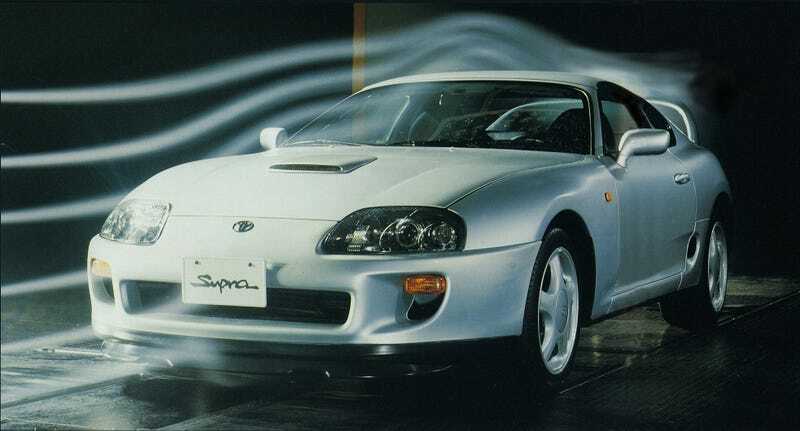 YouTube videos of 1,000 horsepower cars and memes from Fast & Furious movies have clouded our memory of how the last Toyota Supra became the icon that it is. Here’s what the car was like before all of that mythologizing, before it became one of the Holy Grails of tuning. Most of my understanding of how the world of cars was laid out came from reading old websites about the sports cars and muscle cars of the 1960s and ‘70s, and the rest came from riding my bike down to my local newsstand when I was a kid and reading the newest issue of whatever British car magazine was on the shelf in the back. Whatever EVO liked, I liked. Whatever CAR said made a Porsche a Porsche, I took as gospel. I still have a habit of looking up old car reviews from the British car magazines and with all of the talk of the upcoming Toyota Supra swirling around, I went looking for reviews of the legendary 1990s MKIV to see what the snobbiest, er, most discerning people in auto writing thought about the thing when it was new and stock, unburdened by legend or Stage 4 turbo kits. Turns out, they were seriously impressed. In 1994, CAR put the Supra up against the then-new BMW E36 M3, which was a more even match than you might think, since this was the Euro-spec car and BMW stifled the E36 M3 that we got in America. The whole review is scanned here, and you should give it a read if you have the time. Here’s the deal. Both cars weighed abut the same. Both had 3.0-liter straight sixes up front, independent suspension all around and rear-wheel drive out back. The Supra, though, is much more powerful, benefitting from two turbochargers the M3 did not have. The Supra’s iron-block engine made 326 horsepower and 325 lb-ft of torque, CAR claims, compared to the BMW’s 286 hp and 236 lb-ft of torque, even with its variable valve timing. It seems like the Supra will be big on power but lower on driving enjoyment. But that’s not how it turns out. The Supra not only stands ahead of the BMW on comfort (with better seats), tech (with traction control) and refinement (with nice highway gearing), but also with much more exciting handling and direct steering. Little flicks of the wheel have the Supra darting through corners. The same action in the M3 hardly move the car at all. Now, not everyone was completely enamored with the Supra. Motorsport tested the car in late ‘93 (you can read the review here) and said it was “not nimble or agile enough to be truly satisfying or quick on twisty roads,” but they also complained that its traction control held it back, saying that it felt “unnatural,” choppy and made the car push at the front. Also, they said that they didn’t like the car because it had such unnecessary features as air conditioning and cruise control. Like I said, the Brits can be, uh, exacting. “You can have your right foot planted to the floor with neither revs rising nor speed increasing,” Motorsport griped about the “unnatural” traction control, “and in more extreme cases you can actually feel the brakes being applied.” It weirded the reviewer out, and goes to show how weird traction control was back in the early ‘90s. Autocar also pointed out that while the MKIV Supra was a third more powerful than the MKIII, the later car was lighter, though the magazine thought that the steering lacked feedback like you’d find in a Mazda or a Porsche. My favorite car reviewer, by contrast, liked the car’s attitude a lot. Tiff Needell on old, old Top Gear, reviewed the Supra like a GT partner to the NSX, lightweight in design but strong, fast but something you can live with every day. “Its manners are impeccable,” Tiff said, and praised that the car didn’t have any “four-wheel drive, four-wheel steering gimmicks” that you’d find on other cars out of Japan’s Bubble Era. So it’s easy for us to think of the Supra as any old kind of two-door that came with a 2JZ from the factory. We think of the car as an overbuilt, big-power brute and little more—a drag racer, meant for quicker drag races with modifications. But there was some real finesse and character to the car, too. Don’t forget that it was a whole package that’s made the Supra what it is. When Do We See The New One, Toyota?